Belmont College holds Summer Pinning Ceremony to honor 2018 nursing graduates. St. Clairsville, OH (July 30, 2018)— Belmont College officials are pleased to announce that the recent nursing student class received academic credentials as part of the college’s 2018 Summer Nursing Program Pinning Ceremony. The ceremony was held at Belmont’s Main Campus in St. Clairsville, Ohio on Wednesday, July 25, 2018. During the Pinning Ceremony, newly graduated nurses are welcomed into the profession by faculty, family and friends and receive their unique Belmont College School of Nursing commemorative pin. 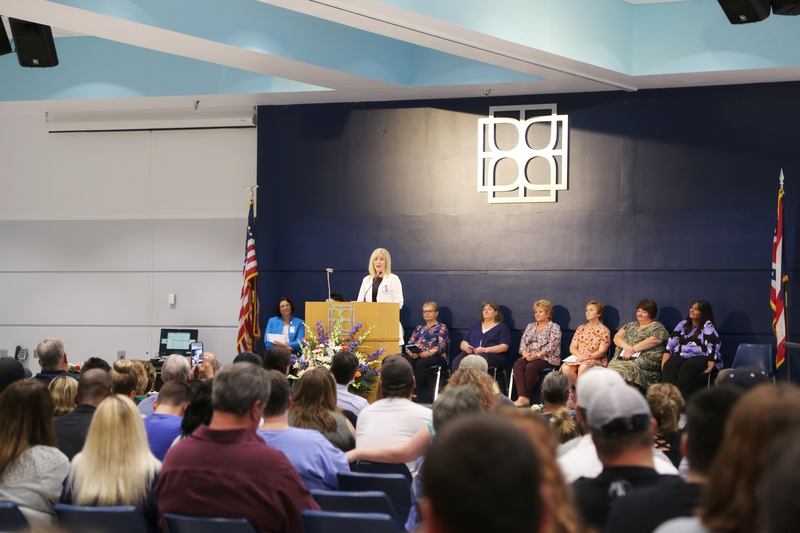 Wendy Brown, Licensed Practical Nursing Class Representative, from Rayland, Ohio, addresses the crowd at Belmont College’s 2018 Nursing Pinning Ceremony. The class was addressed by the following class representatives: Wendy Brown, of Rayland, Ohio, Licensed Practical Nursing; Christine Younger, of Moundsville, West Virginia, Associate Degree Nursing; and Kerry Berry, of Bethesda, Ohio, Licensed Practical Nursing to Registered Nursing/Transitional. 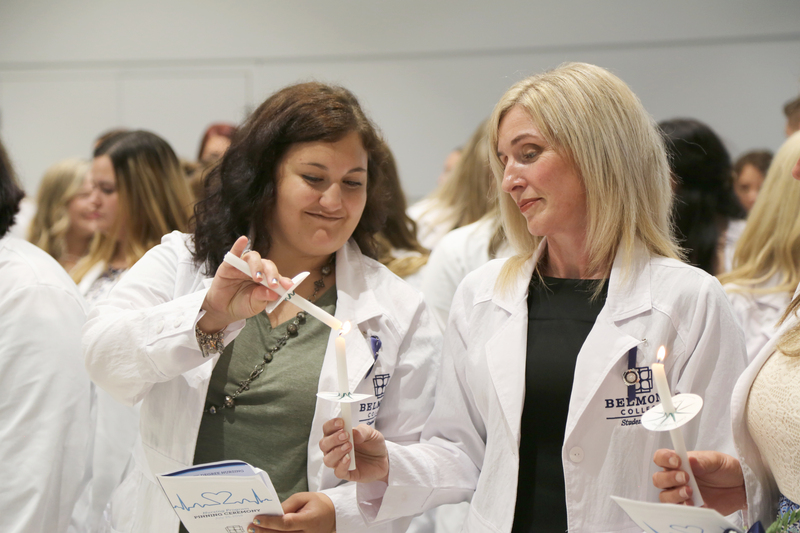 Nursing students, Laine Fankhauser (left) and Wendy Brown (right), join their classmates as they honor Florence Nightingale and the profession of nursing by participating in the candle lightening ceremony and reciting the Nightingale Pledge. At Belmont College two nursing programs are maintained; the Associate Degree Nursing (ADN) program and the Practical Nursing (PN) certificate program. These programs are designed to provide an educational opportunity in which students develop a scientific basis of nursing practice and master technical skills. Under direct supervision of qualified instructors, Belmont College nursing students experience patient interactions, in-class lectures, and hospital clinical experiences which all foster caring and empathetic approaches to nursing care. Moreover, a career in nursing has been and continues to be one of the most in demand jobs in the healthcare industry. According to the 2018 US News and World Report job prospects for nurses look good, with the Bureau of Labor Statistics projecting a faster-than-average 15 percent growth in jobs between 2016 and 2026 and an average annual salary for registered nurses of $70,000. Additionally, the nursing faculty that instructs and oversees the ADN and PN programs take their mentoring roles very seriously as they work on a daily basis to encourage students and provide them with a successful start. Many of these faculty members are highly experienced veterans with over 30 years of experience. The range of these professors’ abilities is broad and includes (but is not limited to): medical-surgical nursing, maternal/infant nursing, chronic disease management and training, mental health nursing, critical care nursing, administrative nursing, pediatric nursing, public health, and home health. A unique aspect to Belmont College’s nursing programs is that tutoring services are available to all nursing students. A nursing tutor is available and works with students on certain proficiencies such as: time-management methods, study techniques, as well as technical and test-taking skills. Furthermore, the college’s Health Sciences Center, the region’s premier healthcare education facility, is home to all Belmont College Nursing programs. The building features state-of-the-art classrooms and science labs for biology, anatomy, and chemistry. These high-tech spaces enhance the learning environment and provide opportunities for students to nurture collaboration and innovation. For more information about the nursing programs at Belmont College visit our website at www.belmontcollege.edu or contact Karolyn Fox, Director of Nursing Programs, at 740-699-3910 or kfox@belmontcollege.edu.